The battle of Mt. Badon—in which, according to the Annales Cambriae (c.
, figure of Arthurian legend also known as Sir Percivale, who is in turn a later form of a hero of Celtic myth. The name originally occurs as Pryderi, an alternative name of Gwry in Pwyll Prince of Dyved, a tale in the Mabinogion. , hero of Arthurian legend. He was the son of Launcelot and Elaine, the daughter of King Pelles. Because he was the noblest and purest of the knights of Christendom, he alone, according to Sir Thomas Malory, achieved the Holy Grail (see Grail, Holy). ..... Click the link for more information. . The Grail is one of the most difficult problems of Arthurian legend, introducing as it does features of Christian story, Celtic myth, and ancient fertility cults. See R. S. Loomis, The Grail (1963); E. Jung and M.-L. von Franz, The Grail Legend (tr. 1971). The Holy Grail is the name given the cup used by Christ during his Last Supper with his disciples. As Luke described it in his Gospel, “And he took the cup, and gave thanks, and said, ‘Take this, and divide it among yourselves’“ (Luke 22:17). Most Christians assume the cup there mentioned no longer exists. In the Middle Ages that assumption was challenged. Between 1180 and 1240, several pieces of historical fiction, composed in Western Europe, told the reputed story of the Grail, the quest to find it (since it had been lost or hidden), and the quest of the hero, a man named Percival, to find the Grail. The most important pieces from this era are the Conte del Graal by Chrestien de Troyes, an epic poem to which others added numerous verses; Parzival, an epic poem written in German by Wolfram von Eschenbach (d. c. 1216); and the anonymously written folk tales collected as the Mabinogion. To these may be added the poetic writings of Robert de Boron, one element of which included the story of Joseph of Arimathea. One thirteenth-century novel, Queste del St. Graal, became the most famous of these early literary pieces as its content was taken almost entirely by Robert Malory (fifteenth century) forhis Morte d’Arthur (1485), the most widely read volume on King Arthur, his knights, and the Grail over the centuries. As the various stories were conflated, the accounts began with the cup of the Last Supper coming into the possession of Joseph of Arimathea. There is a certain logic to this initial connection, as in the Bible, Joseph is the one who asks Pontius Pilate for permission to take Jesus’ corpse to prepare it for a proper Jewish burial (Matthew 27:57–60). The story elaborates on this, however, by saying Joseph stands under the cross and catches Jesus’ blood in the cup—the event that gives the cup its reputed magical properties. With the cup, he travels to the British Isles, where he founds the Christian movement (which means British Christianity predates the later evangelism of the islands by representatives sent from Rome). During the years of the good King Arthur, various knights undertook the quest for the lost Grail, of which Percival is the most noteworthy. A few, like Sir Galahad, were also successful in their quest, but most failed due to their various character flaws. Though some knights found it, they did not bring it back with them to the larger society or Christian community. Various groups were subsequently believed to have become the possessors of the Grail, the most famous being the mysterious Knights Templar. If the Templars had the Grail, it was lost again when the order was suppressed by the French King Philip the Fair (1268–1314) at the beginning of the fourteenth century. Several churches claim to possess the Grail. For example, there is an ancient cup with an Arabic inscription on its base that the cathedral at Valencia, Spain, prizes as the original Grail. Crusaders brought a green cup to Genoa, Italy, and for many years it was claimed to be the Grail and to be made of emerald stone. Napoleon took possession of it after conquering northern Italy. When it was being returned to Genoa after Napoleon’s defeat at Waterloo, it was proved to be made of mere glass, a fact that greatly weakened Genoa’s claims concerning it origin. Additional stories have tied the Grail to such varied locations as Rosslyn Chapel, the spring at Glastonbury Tory, Oak Island, Nova Scotia, and Accokeek, Maryland. Among the most interesting new twists on the Grail legend was supplied by Michael Baigent, Richard Leigh, and Henry Lincoln in their bestselling book, Holy Blood, Holy Grail, originally published in France in 1982. In this volume, the Grail legend was integrated into an alternative secret history that asserts Jesus survived the crucifixion and, with Mary Magdalene, founded a bloodline (the holy blood) that later emerged as the Merovingian royal family in France. The protection of the bloodline was the great secret of the Knights Templar, a task later passed to the Freemasons. Ashley, Mike, ed. The Chronicles of the Holy Grail. New York: Carroll & Graf, 1996. Baigent, Michael, Richard Leigh, and Henry Lincoln. Holy Blood, Holy Grail. New York: Bantam Books, 1983. Bryant, Nigel. The Legend of the Grail. Woodbridge, Suffolk: D. S. Brewer, 2004. Marino, John B. The Grail Legend in Modern Literature. Woodbridge, Suffolk: D. S. Brewer, 2004. Matthews, John. The Grail, Quest for the Eternal. London: Thames and Hudson, 1981. The legend of the Holy Grail flourished in late medieval Europe, becoming one of the most popular and enduring themes of medieval literature. Writers, traveling minstrels, poets, and storytellers spun many different versions of the tale, but most centered around the search for a mysterious vessel which could restore one's health or bring one closer to God. For medieval Christians such a receptacle immediately brought to mind the chalice of the Eucharist. Indeed later tales made this connection explicit. These tales identified the mysterious vessel as the chalice from which Jesus and his disciples drank at the Last Supper (for more on the Last Supper, see Maundy Thursday). According to legend Joseph of Arimathea used this same chalice to collect Christ's blood at the Crucifixion (for more on crucifix- ion, see Cross). Thus the Grail became not only the holiest of relics but also the supreme symbol of the Eucharist, the Christian ritual commemorating the events surrounding Jesus' death and resurrection. Because of its connection to the death and resurrection of Christ, the Holy Grail, like the Eucharist, may be thought of as an Easter symbol, one that centuries ago captured the imagination of a continent. The earliest surviving legend concerning the Holy Grail was written by a French poet named Chrétien de Troyes around the year 1180. He called the tale Perceval, ou Le Conte du Graal, which means "Perceval, or the Story of the Grail." It recounts the story of a young knight named Perceval, who is innocent to the point of foolishness. In his aimless wanderings Perceval encounters a wise fisherman. This fisherman advises the youth to visit a mysterious castle surrounded by a wasteland. Perceval journeys to the castle and presents himself to its lord, who is called the "fisher king." An incurable wound confines the king to his couch. While in the king's castle the young knight witnesses a strange procession, including a page with a white lance from which hangs a drop of blood, two pages carrying golden candelabras, a maiden carrying a glowing metal grail (a shallow bowl) set with gems, and another maiden carrying a platter of silver. Though he wonders at the meaning of this parade, Perceval says nothing. In failing to ask the question "Whom does the grail serve?" or "What ails thee, uncle?" the young knight has failed a magical test set for all who find the hidden castle of the fisher king. Those words, spoken by an innocent soul such as Perceval, could have broken the spell which kept the king's wound festering. The king cannot explain this to the young knight as he himself is struck speechless in the presence of the Grail as a penalty for his past sins. As a result of Perceval's failure the castle magically disappears and the young knight spends years looking for it. Chrétien de Troyes died before he could finish the story. Nevertheless, his tale inspired a number of other writers, who retold it in their own ways. De Troyes used the word "grail," or graal in the Old French, to describe the mysterious shining vessel borne by the noble maiden. The word originally referred to a deep serving platter or shallow bowl. Later writers began calling this container the "Holy Grail" and identified it clearly as the chalice of the Last Supper. Other versions of the story defined the Grail as a precious stone, a cup, or a gem that fell from the crown of Lucifer, the devil, during his epic battle with God. In 1207 a German poet and knight named Wolfram von Eschenbach (c. 1170-c. 1220) penned his version of the Grail story, called Parzifal, or Perceval. Von Eschenbach understood the Grail to be an emerald that fell from Lucifer's crown. In von Eschenbach's story this emerald bestows many miraculous blessings on those in its presence, including restoring youth, prolonging life, conferring spiritual perfection, and drawing one towards God. According to von Eschenbach a mysterious figure called the Grail King becomes the custodian of this holy object. Instead of dedicating himself to its protection, however, the Grail King gallops off in search of romance and adventure. Disregarding his sacred duty causes the king to be wounded in the course of his travels. The wounded Grail King returns to his castle to find that the territory that surrounds it has become a wasteland. Since the power of the Grail protects him, the wound cannot kill the Grail King but neither does it heal or grow less painful. One day Perceval, an innocent and unsophisticated young knight from King Arthur's court, happens upon the realm of the Grail King. Perceval dines with the Grail King in the banquet hall, and notices the king's discomfort. Perceval almost asks, "What ails thee, uncle?" but restrains himself, having once been told by a mentor not to ask too many questions. Just as in de Troyes's story, Perceval fails a magical test when he censors his own spontaneous act of compassion. Perceval rides away from the castle the next day, and though he tries to return, he cannot find it. Several years and many adventures later, Perceval encounters a darkskinned Muslim youth named Feirefiz. Feirefiz spares Perceval's life in battle. Afterwards they discover that Feirefiz is Perceval's half-brother and the two become friends. These acts of compassion and reconciliation help Perceval in his quest to return to the Grail Castle. He does so, accompanied by Feirefiz. When Perceval sees the Grail being borne into the Great Hall by a beautiful maiden, he then turns and asks the king what ails him. This question heals the king's wound and restores life and vigor to his lands. When the king dies Perceval becomes the new Grail King, whereupon he is joined by his wife and sons. Early in the thirteenth century French poet Robert de Borron wrote a long poem entitled Joseph d'Arimathie, or "Joseph of Arimathea." This poem proclaims the Grail to be the chalice of the Last Supper and tells how Joseph of Arimathea became its keeper. Although the Bible informs us that Joseph of Arimathea was a follower of Jesus and that he buried Jesus'body in his own tomb (Matthew 27:57-59), it offers no further details on his life. De Borron supplied these details, explaining that after Jesus'death Joseph of Arimathea journeyed to England as a missionary, bringing the chalice of the Last Supper, or the Holy Grail, with him. He landed at Glastonbury, where he and his descendants established themselves as the mysterious keepers of the Grail. Around the year 1225 another Grail legend appeared on the scene. Scholars have not reached a consensus on who wrote this tale, titled Queste de Saint Graal (The Quest for the Holy Grail). The storyline strengthened the existing ties linking King Arthur and his knights to the story of the Holy Grail. In this Grail legend, the author introduces the pure knight Sir Galahad. All of King Arthur's knights venture forth in search of the Holy Grail, yet only Galahad is virtuous enough to come into its presence, and thus to receive its holy wisdom. In this version of the story, the search for the Holy Grail becomes a quest for oneness with the Divine. The author implies that only those wholly motivated by virtue can hope to achieve this quest. Some scholars believe that the author of this tale was influenced by the teachings of St. Bernard of Clairvaux (1090-1153), who described the stages through which people move in seeking a mystical, or direct, relationship with God. The hero, the sinless Sir Galahad, is the son of Sir Lancelot, who is inflamed by an illicit love for King Arthur's wife Guinevere. By making Galahad the hero of his story rather than Lancelot, the author of this tale contrasts the spiritual limitations of those enthralled by earthly loves with the spiritual achievements of those enthralled by the love of God. Around the year 1470 English writer Sir Thomas Malory presented his Grail legend along with other tales concerning King Arthur and his knights. Malory's work, called Le Morte D'arthur, or "The Death of Arthur," assigns a greater role to the foolish young knight Perceval than did the earlier story, Queste de Saint Graal. Both works, however, elevated him to a new status as one of King Arthur's knights. In Malory's tale Arthur's knights receive a vision of the Grail while assembled in the Great Hall at Camelot. All set out to find the holy vessel, but one by one, their character defects cause them to turn aside from the quest. Only the virtuous Sir Galahad, the ordinary Sir Bors, and the innocent Sir Perceval find the Holy Grail. Here Malory implies that the qualities that they represent - purity, humility, and openness - are the ones that allow us to draw close to God. Malory seems to rank purity the most important of these three virtues, since only Sir Galahad actually looked into the Grail and came to know all its secrets. After finding the Grail the knights proceed to the mysterious city of Sarras, bringing the holy relic with them. There the three participate in a mystical celebration of the Eucharist, in which Christ himself appears as the celebrant. Galahad is crowned king of the Sarras, but dies a year later, at which time the Grail is taken up into heaven. Perceval then returns to Grail Castle. He finds the wasteland that had surrounded the castle restored to life and he becomes king of the renewed realm. Sir Bors makes his way back to Camelot to tell the tale of their adventures to the world. Scholars have long pondered the meaning and the origins of the Grail legends and have come up with dozens of explanations for these tales. Many claim that their roots lie in Celtic mythology. These writers point to Celtic legends describing various magical cauldrons, platters that offer a never-ending supply of food, and a wounded king who lived in a wasteland. They argue that the Grail legends reworked these Celtic images, presenting them in a new, Christianized story. Other writers see elements of myths and rituals from the ancient Mediterranean and Middle Eastern world in the Grail legends. Yet another group of researchers views the story as basically Christian. One of these scholars reminds us that during the era when legends concerning the Holy Grail spread throughout Europe church leaders were developing and proclaiming the concept of transubstantiation, a doctrine purporting to explain the mechanism by which the wine of the Eucharist became the blood of Christ (see also Eucharist). This line of thought suggests that a fascination with the mysteries of the Eucharist spread throughout European society at this time, inspiring the fanciful Grail tales and creating receptive audiences for these stories. Whatever their origins, these stirring legends convinced many that the Holy Grail actually existed and could be recovered. For centuries adventurers, military men, scholars, and politicians set out on their own quests to recover and possess this holiest of relics. In 1099 a well-to-do Italian by the name of Guglielmo Embriaco journeyed to the Middle East to participate in the First Crusade, a series of battles in which European Christians attacked Muslim cities in the Middle East, hoping both to plunder them of their treasures and to place the territory under Christian rule. Embriaco and his followers helped to retake the city of Tyre. As a reward for his efforts, Embriaco appropriated for himself a green, hexagonally shaped bowl, said to have been carved from a single, large emerald. Many believed it to be the cup of the Last Supper, or the Holy Grail. Embriaco carted it back to his native city, Genoa, where it was dubbed the Sacro Catino, or "Holy Bowl," and held as a sacred relic in the cathedral of San Lorenzo. In 1522 the Spanish attacked Genoa, supposedly with the intent of capturing the Sacro Catino. Spanish soldiers battered down the doors of the cathedral, but failed to discover the hiding place that the Italian clerics had devised for the holy relic. In 1806 another foreign invader succeeded where the Spanish had failed. The French military commander and emperor Napoleon Bonaparte (1769-1821) captured the city of Genoa, seized the Sacro Catino, and took it back to Paris with him. There scientists examined the bowl. They found it to be made of green glass rather than emerald, and dated it to about the first century. Not only did they destroy hopes that the Sacro Catino could be the Holy Grail, they also destroyed the Sacro Catino, breaking it into ten pieces while examining it. Nine of these pieces were eventually returned to Genoa. Although many adventurers sought the Holy Grail in its native land, others suspected that the sacred cup left the Middle East soon after the death of Christ. Some believed the legend that Joseph of Arimathea brought it with him to Britain. At Glastonbury, the supposed site of his landing, local traditions suggested that the Holy Grail was buried somewhere on Glastonbury Tor, a rocky hill outside the town. Others whispered that it had been tossed into nearby "Chalice Well." Another legend declared that the Holy Grail ended up in France, not Britain. It stated that after Jesus'death Mary Magdalene became the keeper of the Holy Grail, and that she brought it with her when she journeyed to France. 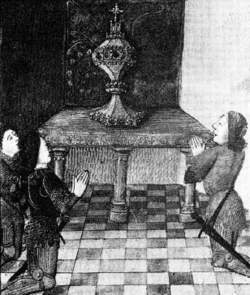 Some speculated that by the Middle Ages the Grail had fallen into the hands of a religious sect known as the Cathars or Albigenses. In that era the Cathars established a fortress on the top of a mountain, known as Montségur, in the French region of Languedoc. When the armies of the Roman Catholic Church marched in to destroy the sect in the early thirteenth century, legend has it that several Cathar priests removed the sacred chalice from the fortress and hid it deep within one of the mountain's many caves. Centuries later the notion that the cup of Christ lies hidden somewhere on Montségur launched what is perhaps the eeriest chapter in the long story of the hunt for the Holy Grail. During the 1930s, a top Nazi official named Heinrich Himmler (1900-1945) launched his own quest for the Holy Grail. Nazi leader Adolf Hitler (1889-1945) entrusted Himmler with the running of Germany's brutal Gestapo, or secret police force, as well as the S.S., an elite branch of the military. In his spare time Himmler enjoyed studying von Eschenbach's Parzifal, which states that the Grail Castle was built on top of Munsalvaesche, or "Mount Salvation." Himmler noted that the Cathars' medieval mountain stronghold, Montségur, bears a vaguely similar name. This piqued his interest in the Cathars and their teachings. The Cathars believed that life in this world was dominated by a struggle between the forces of good and evil, darkness and light. In this doctrine Himmler found support for the Nazi campaign to destroy the Jews, whom he identified with the forces of evil. Himmler came to believe that possession of the Holy Grail would strengthen the Nazis' claim to rule Europe. Confident that the Nazis, as representatives of the forces of good and light, were the rightful heirs of the Holy Grail, Himmler joined forces with medieval historian Otto Rahn (1904-1939), also a member of the S.S. Rahn's studies had led him to conclude that the Grail was hidden somewhere on Montségur. In addition, Rahn proposed that the Holy Grail was not the chalice of the Last Supper, but rather a set of wood or stone tablets on which were written the mystical teachings of the pagan Aryan, or Germanic, peoples. This notion excited Himmler and others, who saw in it support for their belief in the superiority of the socalled Aryan race. In 1931 Rahn traveled to France to seize the Grail and cart it away to Germany. Presenting himself to local people as a tourist, Rahn spent three months searching for the elusive prize but never found it. Nevertheless, in 1933 he published a book about the Cathars and the Holy Grail, entitled Kreuzzug gegen den Gral (Crusade against the Grail). The S.S. sent Rahn back to France in 1937. No one knows what he discovered on this trip, since he died shortly after returning from Montségur. The ornate sanctuary that Himmler had already begun to prepare for the Holy Grail remained empty. The legend of the Holy Grail has continued to inspire tale-tellers and artists down through the centuries. In Idylls of the King (1859-85) English poet Alfred, Lord Tennyson (1809-1892) presents readers with a new telling of the Grail story. Moreover, a number of important members of the Pre-Raphaelite Brotherhood, a group of nineteenth-century English artists, represented scenes from the Grail story in their work. For example, poet and painter Dante Gabriel Rossetti (18281882) depicted "How Sir Galahad, Sir Bors, and Sir Percival were fed by the Sanc Grael but Sir Percival's sister died by the way" (1864), and Edward Burne-Jones (1833-1898) designed a tapestry portraying "The Attainment of the Grail" (1898). Famous German composer Richard Wagner (1813-1883) based his opera Parsifal (1882) on Wolfram von Eschenbach's medieval Grail legend. American-born English poet T. S. Eliot (1888-1965) wove elements of the Grail story into his famous work The Wasteland (1922). Finally, the 1989 movie Indiana Jones and the Last Crusade tells the story of a twentieth-century Grail quest, in which an American archeology professor and his small band of companions prevent a battalion of Nazis from claiming the chalice of the Last Supper for the Third Reich. These and other artistic works, as well as the many historical and theoretical treatises concerning the chalice, continue to delight and intrigue the public. Through them the Holy Grail, that most precious icon of the mysteries surrounding Jesus' sacrificial death and resurrection, still beckons to the romantic and the pure in heart. Sir Galahad, Parzival, and Bors from King Arthur’s court worship the Holy Grail in this fourteenth-century artwork. As the goal of innumerable quests by virtuous knights, the Holy Grail, the chalice or serving dish used by Jesus during the Last Supper, has been hidden away for centuries by a secret society that wants to keep the grail’s magical and transformative powers for themselves. The Holy Grail is most often identified as the serving dish or the chalice that was used by Jesus during the Last Supper. The word grail may have originated from garalis, which derives from the medieval Latin cratalis, a mixing bowl. Garalis became greal in medieval French, grail in English. Another possible origin for the word is based on the writings of a Christian monk named Helinandus, who wrote of a hermit who, around the year 717, had a vision of a dish used by Jesus at the Last Supper. The hermit called it a “gradale,” which in French meant a wide and deep dish on which various meats are placed. French tales described the serving dish as greal (“pleasant”), which became grail in English. According to one tradition, Joseph of Arimathea, the man who claimed Jesus’s body from the cross and provided the sepulcher in which he was placed, came into possession of the Holy Grail. Imprisoned for several years for expressing his faith that Jesus was the Messiah, Joseph, upon his release, traveled to Britain and took the grail with him. When he died, the sacred relic passed on to his descendants, who learned that it had magical qualities for the righteous. A few generations later, because of some transgression and a general lack of humility and virtue by keepers of the grail, the powers of the vessel were diminished and its exact location became uncertain. An alternate version of Joseph’s involvement with the Holy Grail has him leaving Jerusalem soon after the crucifixion and resurrection of Christ and taking with him the grail, as well as Mary Magdalene and her children—who, in this story, had been fathered by Jesus. Other accounts state that Mary, as the wife of Jesus and the mother of his children, was herself the grail, the “vessel” by which the Davidic bloodline was brought out of Israel. Combine these two accounts and shade them slightly to have Mary traveling to Scotland and secreting the Holy Grail on the site where Rosslyn Chapel would be built, just outside what is now Edinburgh. The most popular Holy Grail stories have been about virtuous Christian knights questing for the lost chalice of Christ. The association with knights and the grail no doubt began with the legend that the Knights Templar discovered the holy vessel (complete with drops of Jesus’s blood) in the rubble of Solomon’s temple in Jerusalem sometime around 1118. Some accounts add that, in addition to this most remarkable holy relic, the knights found ancient documents proving that Jesus married Mary Magdalene. The Holy Grail and the proof of the marital union between Jesus and Mary were kept in Templar custody in Paris until the arrest of Jacques de Molay, the grand master of the Temple, by King Philip of France in 1307. Fugitive Templars spirited the holy treasures to safe haven in Scotland sometime around 1312, and the Grail eventually was hidden in Rosslyn Chapel. The familiar tales about King Arthur and his knights and their quests for the Holy Grail began to be popular in France, Germany, and England in the second half of the twelfth century. The accounts usually begin with a knight’s receiving a revelation about the sacredness and power of the lost grail, then embarking on a quest for the esteemed relic. Characters in grail stories are often archetypes, representing certain human traits as deployed by the author to present Christian teachings. The knight’s success or failure in quest of the grail serves as a reflection on what is considered good and bad behavior. Between 1160 and 1180 the French poet Chrétien de Troyes wrote five major works about Arthur and his knights based on history and legend. Around 1200 the German poet Wolfram von Eschenbach wrote a grail legend, Parzival, about a youth who sets out to become a knight in Arthur’s court. Along the way the title character stops at the castle of the Fisher King, where Parzival witnesses a procession bearing a glowing object (the grail) and a spear (the one that wounded Christ). In the presence of the grail, the Fisher King is struck dumb. Because Parzival has a pure soul, he could have spoken in the presence of the grail and used its magical powers to heal the infirm Fisher King. Only much later, after many wanderings, does Parzival learn about the true nature of the grail. He returns to the castle of the Fisher King, who is revealed to be his uncle, heals him, and restores the king’s land, which had become barren when he became infirm. In Le Morte d’Arthur, a collection of Arthurian tales by the fifteenth-century English writer Sir Thomas Malory, the grail becomes the object of a quest among the knights of the Round Table at King Arthur’s castle, Camelot. The quest is eventually accomplished by Sir Galahad, who, as an emblem of Christian virtue, alone achieves the grail. Dan Brown’s bestseller The Da Vinci Code renewed interest in the old traditions of the Templars, the Holy Grail, and Rosslyn Chapel. An American academic, David Conley, who claims to be a descendant of Hugues de Payens, the founder of the Knights Templar, has suggested that high-tech electronic equipment be used for an examination of Rosslyn Chapel to find out if the holy relics are really there. On May 7, 2005, Conley told Liam Rudden of the Edinburgh Evening News that he believes the Templars were entrusted with the Holy Grail, the Ark of the Covenant, and a number of ancient scrolls and that the sacred objects are hidden in an underground tunnel system beneath the chapel that mirrors the design of Solomon’s temple in Jerusalem. A very desired object or outcome that borders on a sacred quest. There are several Holy Grails in the computer business. Standards tend to be high on the list; for example, having "one" standard that everybody uses and is happy with for each required area. Writing software once and having it run on every computer platform is also desired by many. Another is a software component architecture that allows software modules to "plug together" like hardware components, no matter the platform they run on or which programming language they were written in. There are several derivations of the meaning of the Holy Grail that come from Christian mythology. For example, some people believe it was the cup Jesus drank from at the Last Supper. Some say it was the cup that Joseph of Arimathea used to collect drops of Jesus' blood at the Crucifixion, while others believe it was the same cup in both instances. Numerous legends of the quest for the Holy Grail, which would bring healing and eternal life, have been recounted in various ancient treatises.